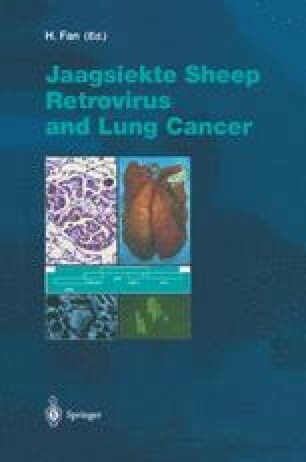 Ovine betaretroviruses consist of exogenous viruses [jaagsiekte sheep retrovirus (JSRV) and enzootic nasal tumor virus, (ENTV)] associated with neoplastic diseases of the respiratory tract and 15–20 endogenous viruses (enJSRV) stably integrated in the ovine and caprine genome. Phylogenetic analysis of this group of retroviruses suggests that the enJSRV can be considered as ‘modern’ endogenous retroviruses with active, exogenous counterparts. Sequence analysis of JSRV, ENTV and enJSRV suggests that enJSRV do not directly contribute to the pathogenesis of ovine pulmonary adenocarcinoma (OPA) or enzootic nasal tumor through large-scale recombination events, but small-scale recombination or complementation of gene function cannot be excluded; experiments involving enJSRV-free sheep, which have not been found, would be needed to investigate this possibility. Evidence of expression of enJSRV structural proteins in tissues of the reproductive tract and lung implies that they do not have a primary role in disease. However, experimental exploitation of exogenous/endogenous retrovirus sequence differences by producing chimeras has been useful in establishing the determinants of JSRV Envinduced transformation. Even if enJSRV do not have a direct role in OPA, their expression during ontogeny or in neonatal life may impact the likelihood of exogenous JSRV infection and disease outcome via the induction of immunological tolerance. Aside from any role in disease, enJSRV loci may serve as useful genetic markers in the sheep and their frequent expression in the reproductive tract of the ewe may portend an important physiologic role in sheep.